The Association’s membership is open to all who have an interest in Bomber Command. The association was originally set up as a veteran group. 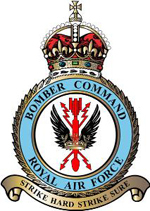 The role is evolving with new members being those who wish to commemorate the service and sacrifice of Bomber Command. Our veterans and their families are encouraged and supported by the extension of membership to the wider community. Throughout the year there are many functions held to bring together members of the Bomber Command Family. Of significance are the functions associated with Anzac Day and our annual Bomber Command Commemorative Day held in all states of the nation. We have members all over the country and overseas. A quarterly newsletter is sent to all members. The newsletter provides members with information on events. It also has a historical feature in each issue. Contributions are welcome from all members. Our President is Dr Ron Houghton DFC. He leads a team of veterans and lay people with an interest in Bomber Command. Attached is the flyer for the Association. Membership form is included. 5 Responses to Bomber Command Association in Australia Inc.
My father,Gerald Lightfoot flew with Bomber Command and I have his Logbook and letters. My Dad Errol Green born 8.6.1916 was a cane farmer…became a pilot..flew 23 missions over Germany. ..shot down 25.6.1942…became a prisoner of war for just under 3 years…in what is now Poland. Just wondering if you have any information about Errol? In January 1945 he was sent on a death march into Germany. ..was in released ..22.4.1945.